On April 9th, Jay led a workshop with Professor Serin Houston’s 15 “Sense of Place, Sense of Planet” Geography students. 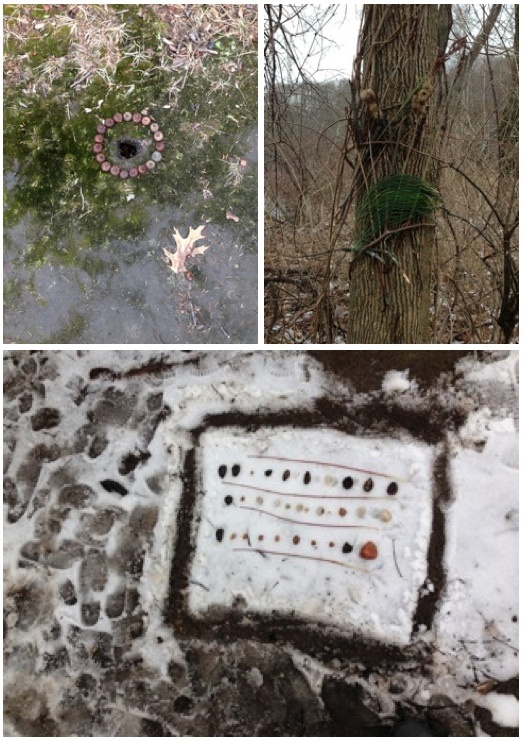 Using found natural materials such as mud, seeds, grasses, bark, wild scallions, leaves, sticks, rocks, acorns, trees, water, flowers and snow, students created art installations around a lake on campus. During the second half of class, students described their processes and pieces, and Jay offered his own observations into the creative dynamics underpinning the installations. Students’ stories travelled from the past to the present to the future and touched on a range of themes including identity, wonder, success and home. While this workshop was a wonderful exercise in the diversity of expression and interest, additionally, the students were given time to engage in serious play with natural materials. Jay emphasized that such creative exercises allow participants to experience deep right brain thinking. Such thinking can lead to insights into issues of personal and global sustainability. That evening Jay presented a public talk on “The Art of Sustainability” to about 50 people. He discussed what it is like to live in the “Cobb Hill” eco-village in rural Vermont and how sustainability inspires the art he creates. “The first thing is love,” Jay told the assembled faculty, staff and students at Mount Holyoke College. “You have to fight for something you love. You have to engage your heart.” He went on to say that “Sustainability needs to flow from the heart and be so integrated into the way humans live that we no longer have to use the word.” Clearly engaged with these ideas, students, faculty, staff and community members asked Jay a multitude of questions about how to translate such expressions of sustainability into urban contexts, how to keep creativity and art alive in the face of ecological crises and how to embody personal ideals to the fullest extent possible. 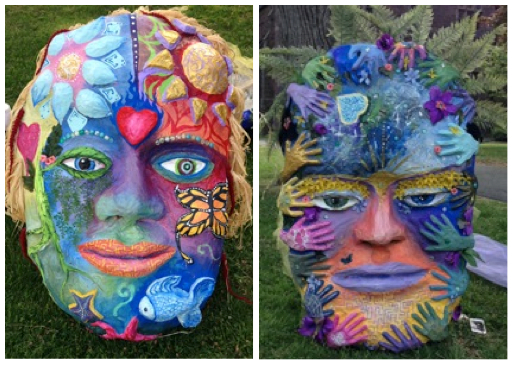 Using hundreds of pounds of clay, car tires and recycled styro-foam, participants collectively shaped the clay into two larger-than-life head molds, “The Spirits of Sustainability.” One head was embraced by a series of hands to exemplify Community, while the second head featured a starfish, butterfly, flower and the sun to symbolize Nature. Then, they layered papier-mâché over the molds as a second step toward creating masks. 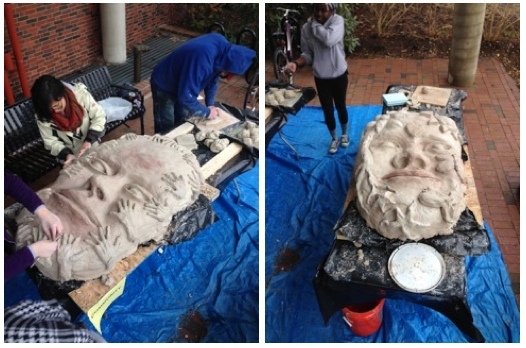 Jay later returned to campus to release the masks from their clay molds. 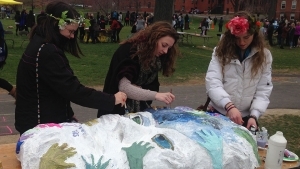 On April 24th, as a part of Mount Holyoke’s Pangy Day (a celebration of spring, the college and the Earth), the masks were collaboratively painted by students. 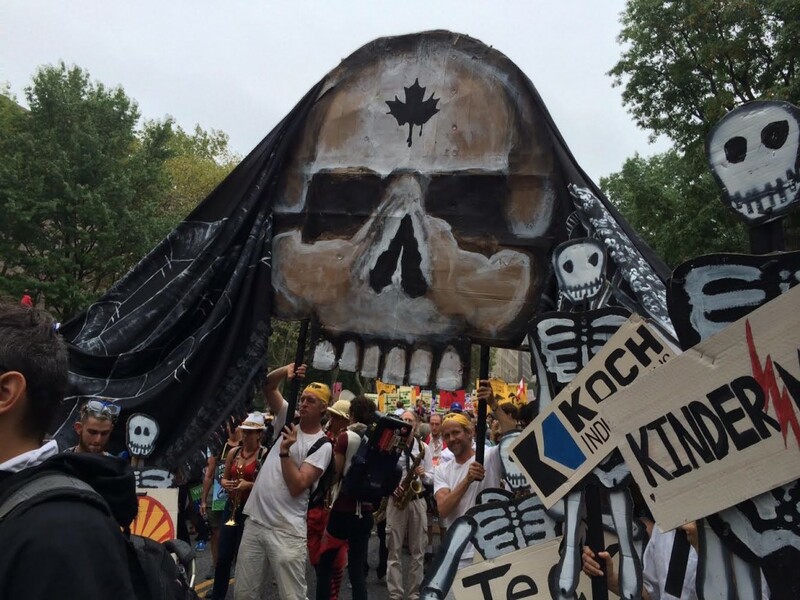 These two “Spirits of Sustainability” will be used for future college events and celebrations. Jay’s visits were sponsored by the Miller Worley Center for the Environment, with additional support from the departments of geology and geography, environmental studies, architectural studies and art, as well as the Office of Student Programs and the Office of Religious and Spiritual Life. 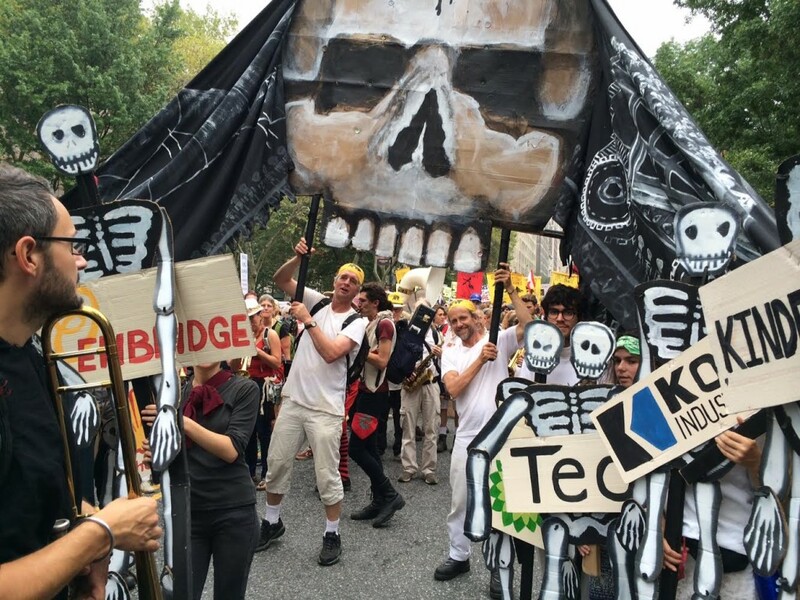 I can summon giant puppets, flags, shadow puppets, stilt walking performance, luminaria, floating-on-water-art, and site-specific art installations to support your next celebration, such as a wedding, party, or event. 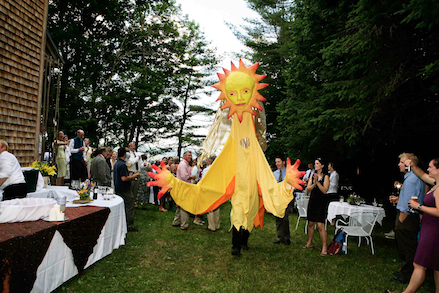 View a short slideshow of wedding photos, enlivened with a giant Sun puppet, bird puppets, and wedding arbor. In 2006, I went for two weeks and created a piece of outdoor pageantry and environmental theater with artists and students. This video shows the process of that production. Many thanks to Colleen Bozuwa for her great work as the videographer.